Obstruction of the vehicular movement has been very common along the Narayanghat-Mugling road section. 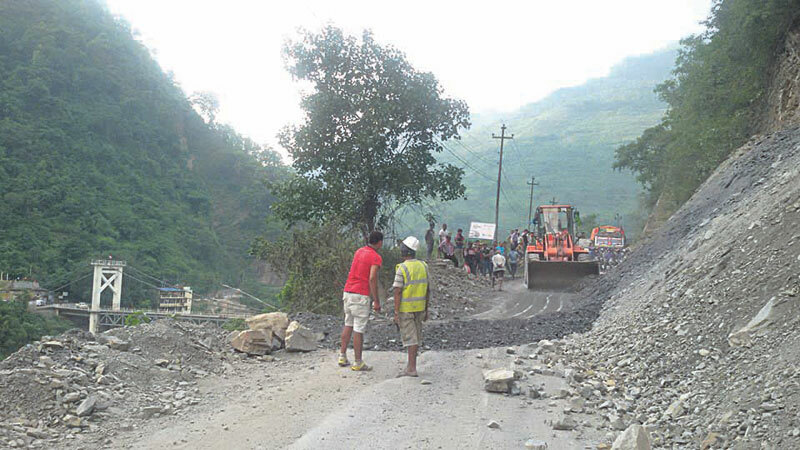 The road that was blocked on Thursday due to landslides at Khanikhola was reopened on only Friday evening. But it was again blocked on Sunday due to a dry landslide at Kali Khola affecting not only the movement of people but also goods. The road has been the only reliable exit route from Kathmandu. Two policemen were killed and two others including a police van went missing on Thursday’s landslide. Likewise, a truck was buried in the landslide injuring its helper. All the passenger buses and trucks were diverted to the Tribhuvan Rajpath on Friday as it took hours to clear the debris from the road. Many people who were returning to their home to participate in the local elections faced ordeals due to the road blockade. Even people traveling to Bajhang and Chitwan had to reach their destination via Tribhuvan Rajpath. The Mugling-Narayangadh section of the road gets blocked for four hours every day due to the ongoing road widening works, and the landslides further cause blockade making journey of many via this route a nightmare. It takes even 10 to 12 hours for one to reach Chitwan from Kathmandu. “It is now easier to reach Ilam from Kathmandu than to travel to Chitwan,” a passenger was heard telling his friends at Daman on Sunday. Though the construction works have been halted from Monday to ease the movement of people for the second phase election, it will take at least two years to overcome the problem due to slow-paced road widening works. The government should also be blamed for the inconveniences the passengers are facing while travelling via this route as the authorities have failed to make the contractors to finish the works in time. Previous Former IGPs, AIGs surrender, leaders got off scot-free!